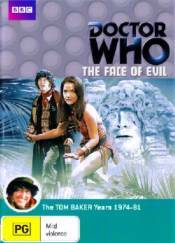 When the TARDIS arrives on a jungle planet, the Doctor encounters two warring tribes, the Sevateem and the Tesh. The Sevateem worship a god called Xoanon and the Tesh are supposedly keeping Xoanon prisoner But why do the Sevateem call the Doctor the Evil One? And what are the invisible creatures in the jungle? The Time Lord, with the help of a girl called Leela, is about to find out.